In the early development of Mountaineering in this area of Scotland, two factors are predominant: the city of Glasgow with its climbing population, and the presence of Professor George Ramsay at the University of Glasgow. The geography of the area can explain the inclusion of Glasgow as a factor in this development, as here is to be found the largest centre of population. As for Prof. Ramsay, he was an experienced Alpinist by the 1860s. In 1866 he founded the Cobbler Club, an informed group who were probably the earliest climbing group as opposed to Walking., in this region. The choice of the Cobbler for the Club name was no accident. That visually striking peak above the head of Loch Long, was also within striking distance of Glasgow, at a time when communication through such rough country was exceedingly difficult and slow. For a long time the easiest way to reach Arrochar, at the top of Loch Long, was by steamer, and there are hilarious stories of climbing parties trying to accommodate a day on the hill with the timetable structure of, hotels, steamers and trains, for the railway line, that great opener of countries had reached Tyndrum by 1880. In 1872, Willie Naismith later recorded, Prof Ramsay gave his Junior Latin Class a lecture on Alpine Climbing, a seminal event for both Naismith and Scottish Mountaineering. Naismith went on to become a founder member of the Scottish Mountaineering Club with Ramsay as it’s first President in 1889. Until that point, Ramsay later wrote he had never, with the exception of Professor Veitch, “met with a single Scotsman who cared seriously to practice the art of Mountaineering. Naismith, whose first ascent list included the North-East Buttress on Nevis in Winter, was also resident in Glasgow. Writing to the “Glasgow Herald” in January1889 to suggest the formation of a Scottish Alpine Club. Naismith would become known as the “Father of the Club”. In July 1889, with the S.M.C. 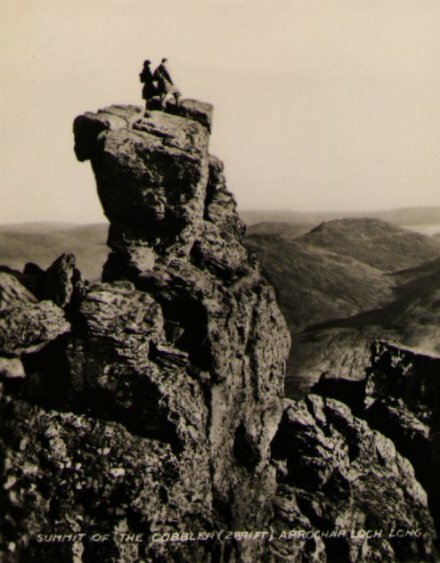 only a few months old, Naismith and Gilbert Thomson recorded the Arete on the Cobbler, a pleasant and exposed moderate climb leading to the summit. In October of the same year, Thomson and friends climbed the classic South-east Ridge on the Cobbler. Though only of Moderate grade, this fine mountain route has several good, exposed situations, linking with the Arete to gain the summit. It was to be the seed crystal for other routes climbed during this first “classic” period.1894 was a year for successful ascents, Naismith and Thomson climbing the South Peak by the Original route. This allowed the South Peak to be explored further, leading to a fine ascent of North-West crack in September 1898, with James Rennie. This is still Severe Grade, to-day on awkwardly placed holds and indicated the technical ability of Naismith. Two years earlier, Naismith, and McGregor climbing Right-angled Gully, Very Difficult, an excellent route on the North Peak, this was in September. If you think the normal route to the summit block, via the Window and exposed traverse ledge is a doddle, try McGregor’s ledge, climbed in 1895. In October 1896, a pair of hard men from the East visited the Cobbler – Willie Tough (pronounced “Tooch”) and Harold Raeburn. They attempted what was to become Ramshead Gully, failing due to ice. A traverse right across the Halfway Terrace then led to the Fold, the crux pitch of Recess Route, which they declined to attempt, reversing their steps. Instead, they made the Second ascent of Right-angled Gully, Typically they attempted the Direct Finish, getting to within 5 metre of the top. Raeburn admitted that it was “clearly impossible”, a snow cornice several feet thick overhanging its outlet, (hard men indeed!) As a reminder of Raeburn’s determination, he returned in October 1904 and climbed the Fold in the company of several ladies. At the end of 1896, Harold Raeburn joined the SMC, living in Edinburgh, the awkward journey across the country was not impossible, but did make day outings very difficult. He did leave his mark in the Arrochar district however, with the Difficult Cave Route on the Cobbler in 1898. climbed with Rennie and of course the crux pitch of recess Route. Another raiding party from Edinburgh was that of the Inglis Clark family. In July 1895, William, a successful chemist, visited the Brack with his daughter Mabel and son Charles. They climbed the Moderate Arete which bears their name. Charles who died in the Great War, would inspire the C.I.C. hut on Nevis, built in his memory. Also on the Brack, the difficult Elephant Gully, named because it’s lush vegetation was sufficient to feed a herd of elephants, was climbed in 1906 by McLaren and the Shadbolts, Gully and Chimney experts. In the same period they climbed the Very Difficult McLaren’s Chimney Creag Tharsuinn. The latter crag had been opened up by MacLay, who had climbed the Gully (now named after him) in April 1900. This busy time of exploration lasting from about 1896 to 1906 was the first of three recognisable periods of activity in the area. It must have been a great time, with every ascent either a first or a second ascent. Scottish Mountaineering then went through its middle ages, plunging even deeper into the mirk with the Great War. Nothing was done, or could be done, as all energy went into the horrendous conflict. We jump to 1921, with Garricks Route on Creag Tharsuinn, Very Difficult in summer, it bridged that long gap between the classic age and the New age just about to begin, with an awareness of the great outdoors and new blood keen to leave the cities. This lonely ascent echoes that of Raeburn’s in 1920 – the winter ascent of Observatory Ridge on Nevis. Then we moved on to the next age. A variation on the Cobbler, in 1927, was recorded by Rutherford and Hutchison, two of the founders of the Junior Mountaineering Club of Scotland ( the JMCS). Refreshingly new, and they were one of more than half a dozen clubs formed between 1920 and 1933, including the Ptarmigan Club (1929), the Creagh Dhu Club (1930) and the Lomond Club (1933). Between them, these clubs would be responsible for the majority of climbs in the Arrochar Alps. Though it is normally unfair to single out any one climber when looking at the history of an area, an exception can be happily made with Jock Nimlin, who with eleven routes on the Cobbler alone, including the complete Recess Route (1935), the Direct Finish to Right-angled Gully (1930) and Nimlin’s Direct Route (1933) to mention a few, can be singled out as one of the pioneers (Nimlin died - summer 1988), and we remember with great respect his superb first guide to the Arrochar area (co-authored) with another unique person – Benny Humble. Ben Humble made a climbing film showing Jock Nimlin, Harry Grant and David Easson climbing the Cobbler - the film is called 'A Cragsman's Day'. Click HERE to view it in it's entirety. See the bottom of this page for further videos on this site. The Creagh Dhu, that almost legendary crew from the shipyards of the Clyde, polished off what lines Nimlin had left taking over after the Second World War. Bill Smith and John Cunningham arrived in 1945 to begin the stream of hard and excellent routes which would continue through the 1950’s. No need to list all of them, several climbs are, however, emblazoned, Cunningham and Smith’s S-Crack, South Peak (1948) and Punster’s Crack (1949) Smith’s Gladiator’s Groove (1952). Back on the South Peak – Ardgartan Face, Taylor and Crawford’s Dicer’s Groove (1956) was E2 a hard lead for the time. Things quietened down somewhat after this on the Cobbler, as transport made Glencoe more accessible. Rest and be Thankful - again the same two climbers. The Arrochar area is mainly Dalradian rocks (Schitz) beautifully folded metamorphic rocks, belonging to the Dalradian succession., these metamorphic rocks are mainly of late-Pre-cambrian and Cambrian age, which makes some of them, though such ages are difficult to comprehend, over 570 million years old. They lie north of the Highland Boundary Fault, which runs NE to SW across Scotland from Stonehaven to Arran and even to Northern Ireland. This fault, which helped preserve younger rocks in the Midland Valley, threw up the rocks to the north, so that later erosion revealed the older rocks below. These Dalradian rocks whose total thickness may be over 16 km, were probably deposited in a shallow sea. As this marine basin continued to sink, erosion on the sedimentary land fed more material, building up layer upon layer of sedimentary rock grits, conglomerates (Loch Lomond area) , mud, grey wakes. Layers formed could be maintained through later changes, so that to-day we see the layered rocks of Arrochar, with scalloped holds perhaps formed by the slightly different rates of weather between the layers. The shape of the mountains, and valley were sculpted by ice, one million year ago, before fridges, polystyrene and spray deodorants, there was a major climatic shift to a colder period, cause unknown. Snow began to lie through the year, flowing downhill as glaciers. The Ice Age had begun. It was to last, with many retreats and advances, until about 10,000 years ago, a mere blink when compared to the age of our planet. The moving ice sculpted the landscape, forming and reforming the shapes of the mountains, to leave them substantially as they are to-day. Some cliffs were, and still are, changing by rockfall, the expansion of freezing water in cracked and other physical forces acting with sometimes dramatic effect. The Cobbler shape, is thought to be caused by Rock Slope Failure – extensive loss of integrity in a mountain-side resulting in slope deformation combination of ice erosion, by frost, rain, wind and snow. At this time a major rift caused a break-up of the crust, resulting in a land mass breaking off, forming Greenland and a part of North America – the Atlantic Ocean was born, and with it Scotland, waltzing away from what would become Newfoundland. The land was higher then, and most rivers in this new country flowed east. The River Clyde was a tributary of the Forth. Several rivers flowed east across what would become Loch Long, just south of Arrochar, one taking a route through Glen Douglas. In the Climbing Guide by B.H. Humble and J.B. Nimlin it is said that Arrochar might well be the birthplace of Scottish Climbing? This may be in part to the existence of the Cobbler Club, which was founded in 1906 by Prof Ramsay, as stated by K.W. 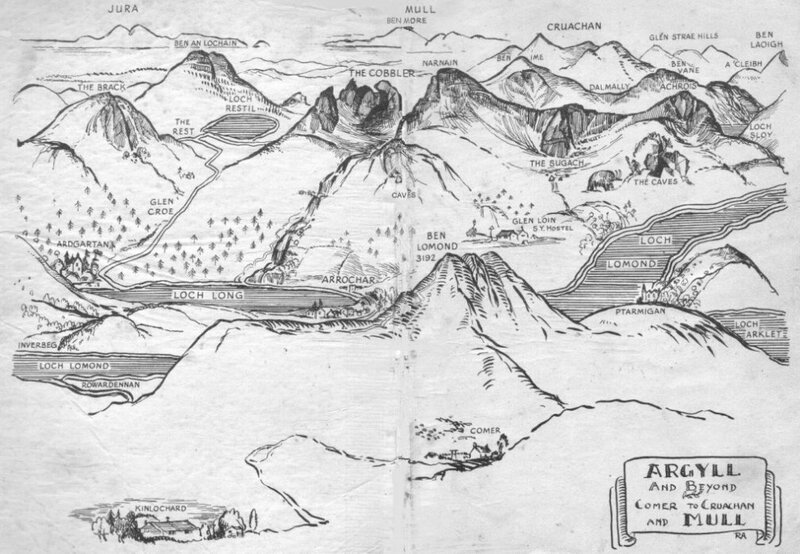 Crocket and A. Walker, in the Arran, Arrochar & Southern Highlands Guide. There were many excellent routes pioneered during this time, however the main push happened post war, mainly by members of the Creag Dhu Club, and later 1970 – the new breed of young climbers pushed the standard higher up the scale. Regarding the historical element for the Heritage Group, was the mode of travel that had to be undertaken during the early part of exploration – namely by steamer and train, with accommodation to be had in Hotels. 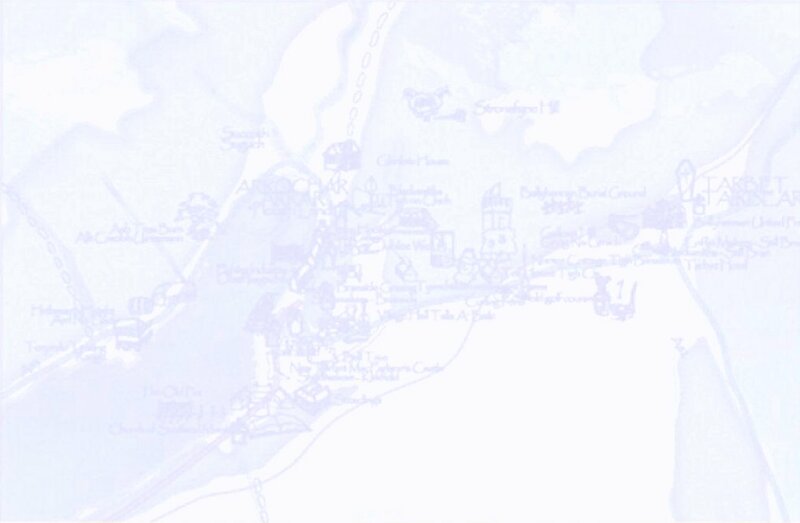 This had to have a financial up-side for the village as a whole, and possibly the start of tourism in the Area.